Women's Maternity Nursing T Shirt Tops Breastfeeding Nursing Shirt Tops with Double Layer on Sale ClearanceSize Chart(Unit:cm/inch) Size:S Bust:88cm/34.6" Shouder:37cm/14.6" Sleeve:58cm/22.8" Length:62cm/24.4" Size:M Bust:92cm/36.2" Shouder:38cm/15.0" Sleeve:59cm/23.2" Length:63cm/24.8" Size:L Bust:96cm/37.8" Shouder:39cm/15.4" Sleeve:60cm/23.6" Length:64cm/25.2" Size:XL Bust:100cm/39.4" Shouder:40cm/15.7" Sleeve:61cm/24.0" Length:65cm/25.6" Size:2XL Bust:104cm/40.9" Shouder:41cm/16.1" Sleeve:62cm/24.4" Length:66cm/26.0"
❃❃Size Details: Size:S _ Bust:92cm/36.2" _ Length:65cm/25.5" Size:M _ Bust:98cm/38.5" _ Length:66cm/25.9" Size:L _ Bust:104cm/40.9" _ Length:67cm/26.3" Size:XL _ Bust:110cm/43.3" _ Length:68cm/26.7"
❤️ Size Chart(Unit:cm/inch) ❤️ ❤️Size:S Bust:86cm/33.8" Waist:80cm/31.4'' Length:78cm/30.7" ❤️Size:M Bust:90cm/35.4" Waist:84cm/33'' Length:79cm/31.1" ❤️Size:L Bust:94cm/37" Waist:88cm/34.6'' Length:80cm/31.5" ❤️Size:XL Bust:98cm/38.5" Waist:92cm/36.2'' Length:81cm/31.9" ❤️Size:2XL Bust:102cm/40.1" Waist:96cm/37.7'' Length:82cm/32.3" ❤️Size:3XL Bust:106cm/41.7" Waist:100cm/39.3'' Length:83cm/32.7"
Size Chart(Unit:cm/inch) * Size:S ---Bust:100cm/39.37" ---Shoulder:40cm/15.74" ---Sleeve:17cm/6.69" ---Length:67cm/26.38" * Size:M ---Bust:105cm/41.33" ---Shoulder:41cm/16.14" ---Sleeve:18cm/7.08" ---Length:68cm/26.78" * Size:L ---Bust:110cm/43.30" ---Shoulder:42cm/16.53" ---Sleeve:19cm/7.48" ---Length:69cm/27.17" * Size:XL ---Bust:115cm/45.27" ---Shoulder:43cm/16.92" ---Sleeve:20cm/7.88" ---Length:70cm/27.56" Note: * Please allow 1-2cm measuring deviation due to manual measurement. * Please check the Size Chart before order. If you are not sure the size, please send message to us. HAPPY MAMA INTERNATIONAL CONVERSION SIZE CHART UK SIZE l 08 l 10 l 12 l 14 l 16 l 18 ---------------------------------------- US SIZE l 04 l 06 l 08 l 10 l 12 l 14 ---------------------------------------- EU SIZE l 36 l 38 l 40 l 42 l 44 l 46 ---------------------------------------- IT SIZE l 40 l 42 l 44 l 46 l 48 l 50 Copyright notice This photos is copyright of Glamour Empire Ltd - © Happy Mama Boutique 2017. All rights reserved. Any redistribution or reproduction of part or all of the contents in any form is prohibited. Hey,pregnant and nursing moms! Are you looking for a nursing tops? Our breastfeeding camisole is a must have, as you can breastfeed discretely anywhere without having to cover. It is worth to getting - We promise. Features: *Soft and comfortable cotton blend material. *Discrete nursing opening,easy to nurse in and doesn't look like a nursing tops. *This breastfeeding tops can make you look great and stylish with leggings or skinny jeans. Sweet gift: It's a good choice for you to express best wishes and love to friends or wife. Size:(inches) M:---Bust:38.6" Length:28.0" Shoulder:15.0" Waist:37.0" L:---Bust:40.6" Length:28.8" Shoulder:15.4" Waist:39.0" XL:--Bust:42.6" Length:29.6" Shoulder:15.8" Waist:41.0" XXL:-Bust:44.5" Length:30.3" Shoulder:16.2" Waist:42.9" Note: As different computers display colors differently, the color of the actual item may vary slightly from the above images, thanks for your understanding. HAPPY MAMA INTERNATIONAL CONVERSION SIZE CHART UK SIZE l 08 l 10 l 12 l 14 l 16 l 18 ---------------------------------------- US SIZE l 04 l 06 l 08 l 10 l 12 l 14 ---------------------------------------- EU SIZE l 36 l 38 l 40 l 42 l 44 l 46 ---------------------------------------- IT SIZE l 40 l 42 l 44 l 46 l 48 l 50 Copyright notice This photos is copyright of Glamour Empire Ltd - Happy Mama Boutique 2017. All rights reserved. Any redistribution or reproduction of part or all of the contents in any form is prohibited. What you get:1*Women Dress　Note： 1. Please allow 1-2cm measuring deviation due to manual measurement. 2. Please check the Size Chart before order. If you are not sure the size, please send message to us. == ❤Size:S ==Bust:92cm/36.2"Shouder:50cm/19.6" Length:65cm/25.5" == ❤Size:M ==Bust:98cm/38.5"Shouder:51cm/20.0" Length:66cm/25.9" == ❤Size:L ==Bust:104cm/40.9"Shouder:52cm/20.4"Length:67cm/26.3" == ❤Size:XL ==Bust:110cm/43.3"Shouder:53cm/20.8"Length:68cm/26.7"➹ How long is the Shipping? ♬ The item will takes 15 days to deliver, sometimes will takes 25 days cause by customs clearance. Hope you could understand. ♬ Our product is good with reasonable price and we believe you will worth it. ➹ What about Return Request? ♬ If there is no hurry for you to have it, you can contact us then we will help you to solve the problem, so please close the return request! Thanks. ➹ Why choose our products? ♬ We have our own supplier. And our products are the best quality, while the price is very reasonable. 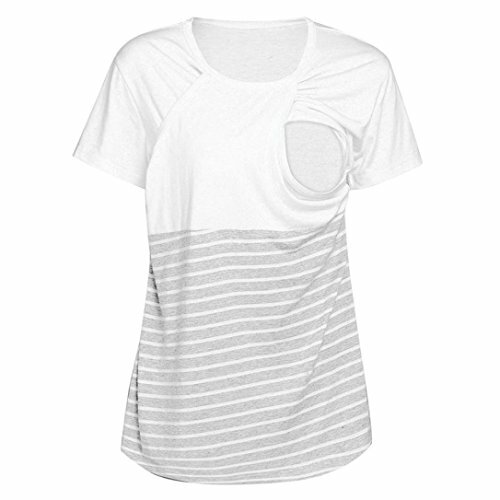 Looking for more Double Layer Stripe T-shirt similar ideas? Try to explore these searches: Alice Flat Adult Shoes, Rapunzel Vegetable Bouillon, and Roadster Oil Pump. Look at latest related video about Double Layer Stripe T-shirt. Shopwizion.com is the smartest way for online shopping: compare prices of leading online shops for best deals around the web. 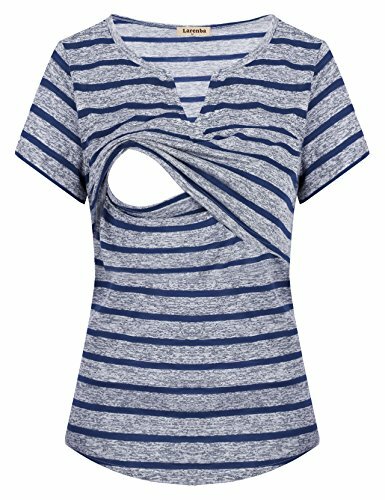 Don't miss TOP Double Layer Stripe T-shirt deals, updated daily.